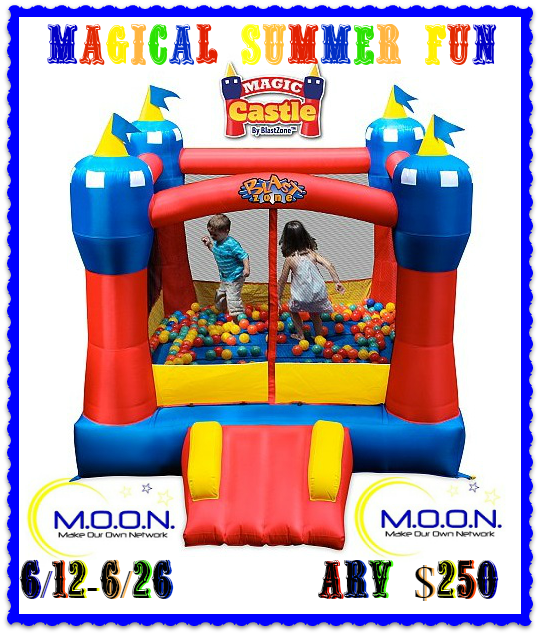 We have here one of my favorite things to giveaway, a bounce house. Enter often for best chance to win. There are daily tasks. Good luck. This is open to Continental US residents only (they are not cheap to ship) and the giveaway ends on 6/26. Good luck. If I could purchase any of them it would be the Rainforest Rapids Bounce House & Water Park, my kids would have so much fun. If money was no object I would get the Rainforest Commercial Inflatable Business Package! Not to start my own business but because I have 9 nine grandkids and this way they could all have a blast! I would get the The Pirates Bay Inflatable Play Park. It's the best of both worlds, water play and a bounce house. My kids would be in heaven with something like this. If money were no object, I would get the ULTRA Croc 13-in-1 Inflatable Water Park! I have three sons and there are three slides- perfect! It has so many activities included that my sons' summers would be filled with fun and no "boring" days! ULTRA Croc 13-in-1 Inflatable Water Park is awesome for my crew. I would choose the Pirates Bay Inflatable Play Park for my nephew. If money were not object, I would buy the Crocodile Isle Inflatable Water Park and Slide! The Pirates Bay Inflatable Play Park. The kids would be having so much fun yet still staying cooled off. And is big enough for all of them. I like the inflatable pirate blaster water park best......that would be hours of fun. I would def get the Rainforest inflatable cause it's so so cool !!!! I love the Spray N Splash 2 Water Park! My niece would have so much fun with it!